When you drop naps, you usually don’t drop that sleep all together. Sleep is rearranged, not dropped, when a nap is dropped. As your baby gets older, sleep time does drop. Usually when you drop a nap, you will rearrange the sleep time and then slowly drop that sleep time later in the day. 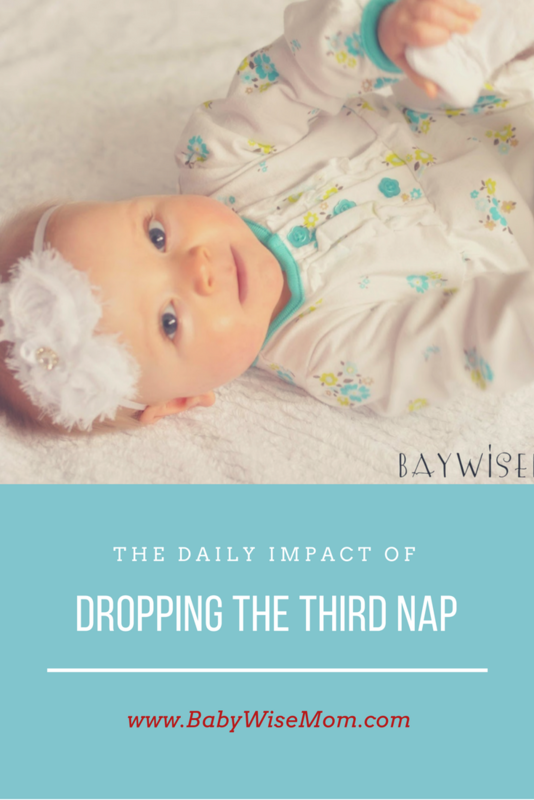 In this post, I discuss the impact of dropping the third nap on your baby’s day. This post contains affiliate links. Dropping the third nap (the evening nap) will impact the rest of your child’s day. Dropping the third nap usually happens around 8 months of age, though the range is 6-11 months. 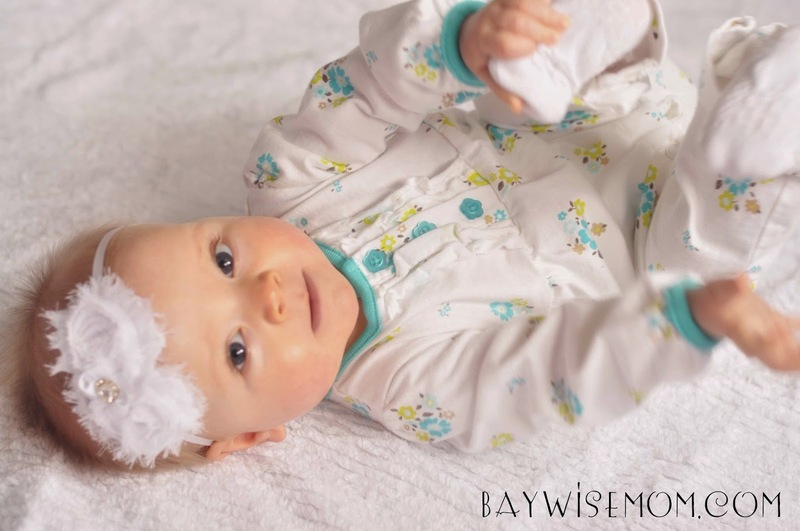 On Becoming Babywise says, “Once the third nap is dropped, both waketime and often the other remaining naptimes will increase in duration” (page 133). This would mean that baby will likely be awake for other times of day and will likely take a longer nap for the other naps. For my children, however, they were up for two hours, slept for two hours, up for two hours, slept for two hours. They didn’t really increase waketime or nap time length. I found that they instead moved bedtime up by about 30 minutes. You could let your child sleep for 2.5 hours and also stay up longer if that didn’t interfere with the nap. If your child can’t stay up longer than two hours and won’t sleep longer than two hours, try moving bedtime up by 30 minutes–at least for a little while. As your child gets older, you can move bedtime back. This was also the case for my son–I tried to lengthen waketimes and naps when dropping the third nap and just ended up with a cranky baby. So we went back to the old schedule, tried dropping the nap with just a longer evening waketime and adjusted bedtime. I thought maybe he'd switch to sleeping 12 hours a night then, but he stayed at about 11-hours nighttime sleep. So we just dropped the 3rd nap last week (She will be nine months old in 3 days). And she hasn't really started sleeping longer during naps?! She gets cranky in the last hour before bed and goes to bed about 30 minutes earlier than she used to. (7:45 or 8 pm- 7:45 or 8 am) She still is sleeping 12 hour nights, but then her naps aren't that long during the day. (A 45 minute- 1 hour nap at 10 and a 1 or 1.25 hour nap around 2) What should her naps during the day be at this point?! I also found with both my boys that nighttime sleep increased by 30 minutes when we dropped the 3rd nap. With Tobias we had to increase it from 10.5 to 12 hours actually, but that's because I had been keeping it at 10.5 hours to squeeze in a last before-bed feeding. With Peter it was an increase from 11 to 11.5 hours of nighttime sleep. Katie, For night, I would go in to her, tell her it is still night time, then when she is calm, put her in bed and do a faster version of your bedtime routine. Lullaby and kisses. Then CIO is probably the best avenue at that age. Jessica,1. You could go either way. If she is happy in there for that 30 minutes, I might leave her. She will be resting and it should help her be able to make it to the next nap time happiily.2. I might nurse her before finger foods at 5:30 since you are feeding those then. Then just put her down instead of nursing before bed. You would want to watch your milk supply to be sure going thhat long would be okay. If not, you could add the nursing back or pump later in the evening. Thanks D&H and Amanda for sharing your experience! My first one dropped his 3rd nap around 5 months on his own with no issues; he just stopped falling asleep when we would put him down at that time. It was about a month after he moved to the 4-hr feeding schedule. My second son wanted to drop his nap EARLY! Like 3 months, right after he moved to a 4-hr feeding schedul on his own! I would put him down and he would just scream and scream. We tried for months to get him to sleep at that time and NOTHING worked: bed, swing, swaddle, moby wrap, NOTHING. He was sooo cranky at the time of the 3rd nap anyways so it was just a hard time until he was about 7 months old. (probably when he wasn't tired and a normal baby would've dropped that nap) But he just REFUSED to sleep at that time. I dealt with the cranky baby but was glad when it was over. Was there something else I should've done? I seem to have an abundant milk supply as both my boys moved to a 4-hr feeding schedule younger than what I have seen here.